Using ESO's High Accuracy Radial Velocity Planet Searcher (HARPS), astronomers have discovered an exoplanet that is remarkable in two aspects; it is orbiting a rare solar twin and that it is found in an open star cluster. 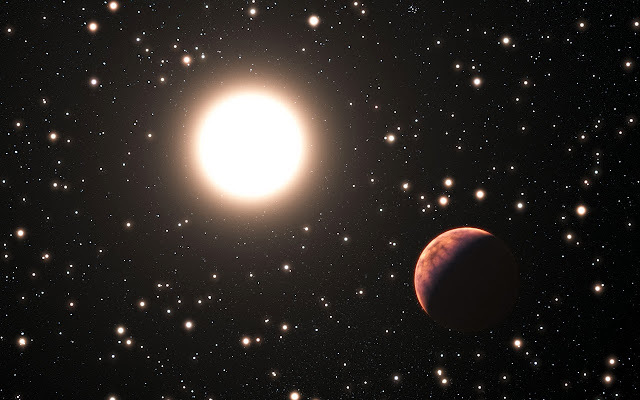 The planet, found in star cluster Messier 67, is orbiting a star that has features almost identical to the Earth's Sun; a solar twin. This is the first solar twin in a star cluster to have a planet orbiting it. The planet is more massive than Jupiter and takes 122 days to orbit the solar twin. A star cluster is a group of stars that are bound together by the gravitational attraction of each star. Messier 67 is an open star cluster which is a group of young stars held together by a weak gravitational field. The existence of a planet within a star cluster is considered very rare and that only six have been found out of around 3000 exoplanets discovered (1000 of these exoplanets have been confirmed). There are two other planets found by HARPS inside Messier 67. One similar to the Sun and the other planet is orbiting a red giant star. The two exoplanets are about 30% the mass of Jupiter. All three planets are outside the habitable zone and orbit close to their host stars making them too hot which rules out the possibility of the presence of water in them. Astronomers have used ESO's HARPS planet hunter in Chile, along with other telescopes around the world, to discover three planets orbiting stars in the cluster Messier 67. Although more than one thousand planets outside the Solar System are now confirmed, only a handful have been found in star clusters. Remarkably one of these new exoplanets is orbiting a star that is a rare solar twin — a star that is almost identical to the Sun in all respects. The team used the HARPS planet-finding instrument on ESO's 3.6-metre telescope at the La Silla Observatory. These results were supplemented with observations from several other observatories around the world. They carefully monitored 88 selected stars in Messier 67 over a period of six years to look for the tiny telltale motions of the stars towards and away from Earth that reveal the presence of orbiting planets. Three planetary companions around M67 stars.